HMH Books for Young Readers, 9780547240039, 48pp. When you’re a guy, nature is one big playground—no matter what the season. There are puddles to splash in the spring, pine trees to climb in the summer, maple seeds to catch in the fall, and icicles to swordfight with in the winter. Nature also has a way of making a guy appreciate important stuff—like how many rocks it takes to dam up a stream, or how much snow equals a day off from school. So what kind of poetry best captures these special moments, at a length that lets guys get right back to tree-climbing and kite-flying? Why, guyku, of course! Bob Raczka is a children's author and poet whose books include Niko Draws a Feeling, illustrated by Simone Shin, Lemonade: and Other Poems Squeezed from a Single Word, illustrated by Nancy Doniger, and many others. He lives with his wife, sons, daughter, and dog, Rufus, in Glen Ellyn, Illinois. Visit him at bobraczka.com. Peter H. Reynolds is a New York Times best-selling illustrator who has created many acclaimed books for children, including The Dot, Ish, and The North Star. His bookstore, The Blue Bunny, and his company, FableVision, both in Massachusetts, are dedicated to sharing “stories that matter, stories that move.” Visit him at peterhreynolds.com and on Twitter at @peterhreynolds. * "This wonderful collection will resonate with all children as they recognize their earnest and sometimes misdirected antics in each poem. The pen, ink, and watercolor illustrations mirror the simplicity of each entry and capture the expressions of the boys and their adventures honestly. This is haiku at its most fun. All libraries should grab it for their collections." "This is childhood as adults remember it, or want to remember it: no flat-screen TVs, no computers, no cars or cellphones. Whether children will recognize their own lives in these wistful visions is not clear, but they will certainly appreciate Raczka's humor." "Non-rhyming poetry can be a tough sell for kids. For some, though, haiku is less intimidating, thanks to its brevity and reliance on rigid rules—and intimidating is one thing this book is not." 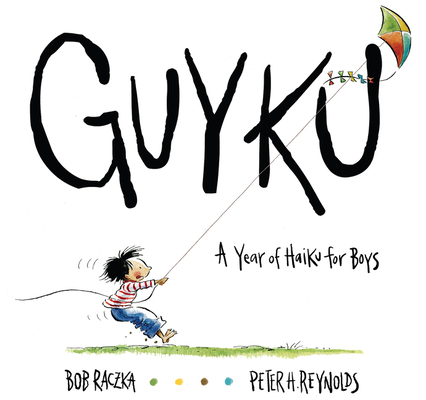 "Raczka and Reynolds are a winning team, and the results will start many boy (and girl) readers thinking about turning their own experience into a seventeen-syllable poem."